Ah, that is right. Thanks for posting it! After much thought, I have decided to put this jersey up for sale. It is nearly identical to the jersey Mike wore that season except in a bigger size and I didnt cut the fight strap off. This jersey took a ton of time and work to get done up and it was all documented here, so I figured I'd offer it here first (can't find the thread though). It goes without saying how rare this is. It basically a size 54/56 in older jerseys, I can get measurements if needed. I am asking $750 or best offer. Thanks all. Boom. 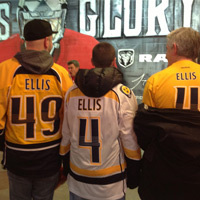 I also confirmed 100% through Josh they are now taking over for the Preds. They can also customize the older jerseys perfectly fine, if not better than Cutting Edge anyways. Especially if you provide detailed information as outlined from that awesome link posted above. I might have an extra, I will take a look. I'd have bought it 10 times if it was actually game worn but that jersey is pretty questionable to me. No wear, no loa, wrong size etc. I think if it was absolutely legit it would go for more than double that. Yeah it has always been John Gray, I havent heard anything about EPS taking over but I do know they can do them to spec. I sent them one last year that I was giving as a gift and it came out perfectly. John is a nice guy but sort of hard to get ahold of and a little bit out there. I'd say just send it to EPS for simplicity's sake. Nice pile o' Panthers. What gamers you got in there? CCM "Center Ice" practice jerseys...worth buying? The Center Ice circle jerseys are awesome. Its too bad the Preds never had those I would buy a bunch of them, probably the coolest practice jerseys ever. and then this guy. It's something else, I think he is going to be really good and I dont know if any of his rookie jerseys are going to surface again. Made a move for it when I had the chance. Ive debated selling it but I think for now I need to keep it. Photomatched the scuffs on the back to the last photo, cant see it in my picture but its a perfect match. The two gwg Blue Jackets jerseys are awesome. I find the similarities between the lack of anything for them and the Panthers to be hilarious. I went to the Panther's draft party because I heard they might have jerseys out too but it was so weird, some had no wear to speak of, no tagging, no info, it was a straight up guessing game. I am more than happy with what I came home with too! Check out the extra lengthened sleeves on this one! Ive never seen anything like it. A whole extra end of the sleeve which looks to be right off another jersey added to it. I have almost every one the Preds have used on my site. I agree, they are cool. My favorite is probably the one that features an @aol.com email address. Like putting your contact info next to a player's Arse was the next big marketing idea for Cutting Edge.